I actually discussed the energies of Valentine’s Day in last week’s post (spoiler: Venus + Neptune in Pisces = romantic, but watch out for drama) so this week I’ll talk about the Lunar New Year instead. The Lunar New Year is always celebrated in conjunction with the New Moon in high-minded, humanitarian Aquarius. (This year, it’s on 16 February.) This Lunar Year belongs to the Earth Dog, so practical matters and community concerns will be at the forefront of this Lunar Year. Chinese astrologer friends have informed me that this Lunar Year is severely lacking in the element of Metal, meaning that money might not be easy to come by – you’ll need extra effort, innovation, and sheer hustle to get that cash in your account! That’s not the only thing happening on 16 February – we also have a partial solar eclipse in Aquarius that will be visible only in parts of the Southern Hemisphere. It’s conjunct Mercury, so this is a good time to start an important phase of personal or business communications. 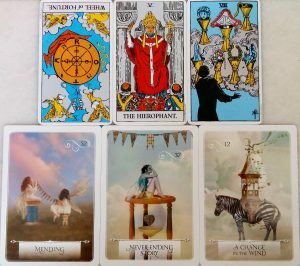 I’ve been asked by a couple of my darling clients if my weekly readings are only relevant for the week they’re published in. The long answer: not strictly speaking, because energies are not bound by time markers. Time is a human concept, after all. I’ve communed with enough divinities, Angels and deceased loved ones to know that time doesn’t really matter in the Spirit realm as much as it does over here. Nor is it perceived in the same way. Seasons of time and energetic shifts are influenced by a wide range of factors, including but not limited to: Divine Will, human freewill, astrological transits, karma + karmic debts, how much prayer/intention was invested into an outcome, etc. My two cents’ worth in all this? Take my readings as road maps for a terrain that can change any moment, but still follows certain rules + patterns. Keep yourself informed, but also be adaptable to change – because change is really the only constant. What’s more important: move forward in faith, hope, and love. live a life of integrity so that no matter what happens, you d0 your best. You keep it real. The assurance and peace of mind that you get from living this way is priceless. LEFT: WHEEL OF FORTUNE REVERSED. This card in reverse can indicate that you’re feeling stuck in a rut, or a bit put out that things aren’t going your way. If you know where you went off-track, try to get the mess fixed; if not, take a step back and reflect. Don’t try to get creative just for the heck of it – taking risks is a huge no-no when the Wheel of Fortune appears ill-dignified. This week, be productive but not over-ambitious. focus on keeping things moving. MIDDLE: THE HIEROPHANT. This card speaks of tradition, structure, and hierarchy. The Wheel of Fortune is all topsy-turvy at the moment, so your best bet this week is to play by the rules and avoid rocking the boat. A strong, almost domineering personality or group/organisational culture could causing you some unhappiness, but don’t let that get to you. Focus on what you can control. Take nothing personally. Respect everyone, but stay out of power games. RIGHT: SEVEN OF CUPS. This card represents the need to manage expectations and make the right choices. At its extreme, it can indicate irrational and delusional thinking – a theme that, as I explained in last week’s post, you’ll find popping up here and there for the next few weeks/months. I always say this: make sure it’s not you. Self-care (NOT self-indulgence!) is key. Keep yourself grounded. Remain objective as much as you can; seek out trustworthy counsel if you need help with a complicated issue. Take time out and spend it in nature. Connect and re-connect with yourself; where you’ve been feeling depleted and unloved, build yourself up and love yourself again. If someone around you is acting out, you have two options: help them out of their rut, or detach and pray for their healing. Be honest about what you can do, and act from a place of love + respect; this includes love + respect for yourself. Remember: the only person you can truly save is you. BE BLESSED: MENDING. This week, the Universe brings opportunities for healing through acts of forgiveness, reconciliation, and making amends. This healing is not only necessary for relationships, but for yourself as well. Whether you move forward with the other person(s) or by yourself, what’s important is that you’ve learnt from the experience, and you are healed and whole again – ready for the next cycle of growth. This goes without saying: if you need to forgive yourself for whatever it is, do it stat. BE CAREFUL: NEVER-ENDING STORY. Remember what I said about choosing to help, or detach from, people around you who are acting out. With Venus + Neptune in Pisces, drama can run high. People who are afraid to take responsibility for their own poor choices tend to create certain dysfunctional narratives to explain why their lives are unhappy. Their psychological dramas are never-ending stories. So long as these wounded souls get the attention they want, even if it’s negative, they will keep telling their stories to anyone who will listen. It is right for us to have compassion for such people – they are hurting terribly! But to truly help them, first we need to discern if they want to be helped. Then we need to be clear about whether we are the right people to help, and how far we can assist them. But even if you feel that you can’t help your perpetually insecure, angry or depressed relative, friend, or co-worker, you can always pray. Prayer is incredibly powerful! And giving over these issues to a Higher Power is often the best thing you can do for someone who’s trapped in their own personal hell. If you notice that you’re starting to create your own never-ending story, stop yourself and start asking some honest questions. Those feelings of rage, hatred, self-pity, depression: where are they coming from? Where and how do you feel unsafe, unloved, unseen, uncared for? Find out where you’re hurting, and love that part of you that is desperate for someone to care. This toxic story can end. And the ending starts with you. BE ADVISED: A CHANGE IN THE WIND. Take heart! Change is afoot – it’s life’s only constant, after all. We began with the reversed Wheel of Fortune and a sense of being stuck, but with the New Moon in Aquarius, the Lunar New Year, a partial solar eclipse, AND the appearance of this card, it looks like you’ll be coming unstuck soon enough. The energy for positive change is here for you, but it won’t happen without your engagement. Remember that you co-create your destiny with the Universe. A time of transformation is coming, and it may feel uncomfortable, but hold true to your beliefs + intentions. Know what you want, and stay the course. Don’t be afraid of the unknown, but be flexible. Magical things happen when you allow yourself to be open to the Universe.